Metallica - Master Of Puppets. Vinyl LP. Bleep. Master Of Puppets needs no introduction. Metallica’s third LP towers over the world of heavy metal. Indeed, since its release in 1986 it’s probably the standard against which every subsequent metal album has been judged. 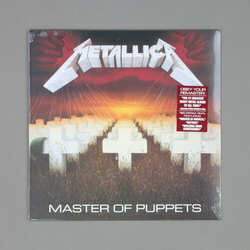 The group’s last record to feature original bassist Cliff Burton, Master Of Puppets is endlessly inventive without ever letting the intensity drop. The title track, ‘Battery’, ‘Disposable Heroes’ - every single cut here absolutely slays. Each member’s playing style on this record has cast a long shadow over the world of rock, from Lars Ulrich’s bust-a-gut drumming to the belligerent yell of frontman James Hetfield. If you haven’t done so already, Master Of Puppets is an essential cop.